What a day full of drama. I guess it never ends here at Alta Bates hospital in Berkeley. If you were in disbelief of what happened over the past few days, you will flip out over the last day at the hospital. We were hoping that the insurance would get its act together so we could leave today. They did actually get everything ready on their part, however, before Romy could be discharged, the way he would get his antibiotics had to be arranged. We were told yesterday that Romy could go into an outpatient infusion center and get his antibiotics injected each day he needed them. However, because it being around Easter and stuff, the infusion center was closed, and the outpatient idea wasn't going to work. The only option we had was to get the PICC line in. We were really avoiding this because Romy didn't want a catheter shoved up his arm and to his heart, especially if he only needed it for a few weeks. But, I guess this was our only option, unless we wanted to stay in the hospital even longer. . . . The nurse ordered the PICC line team to come by Romy's bed whenever they were available. Apparently, the PICC line team is in high demand and isn't available without prior arrangement. We were told we were "very lucky." Whatever. This is the breakfast meal that finally came. Rice Crunchins! It was still morning, but Romy's food was a bit late to arrive, as it normally was late because of the gluten-free allergy. When it did eventually come, Romy was napping, and I was bored, so I started looking at the breakfast. It was some General Mills Rice Crunchins cereal and milk, with a banana and juice. I flipped the cereal over to look at the list of ingredients. I was absolutely horrified when I read down the list. The cereal contained barley malt extract, which contains gluten! I notified the nurses right away, who contacted the dieticians. We informed them that barley malt extract contains gluten. They were very puzzled and seemed genuinely unaware of this fact. The dietician told us that they thought it was the only breakfast cereal that was gluten-free. The packaging does not indicate that it is gluten-free. Rice Crunchins is not gluten-free! 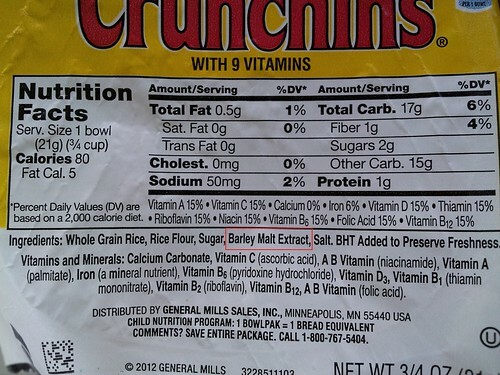 Rice Crunchins has barley malt extract, which contains gluten! Romy doesn't have Celiac's disease, he is only gluten-intolerant. 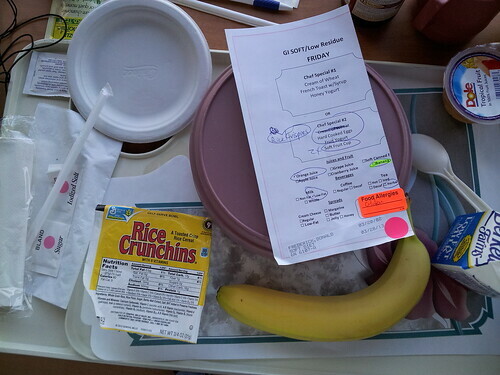 But, can you image that this stupid hospital has been feeding Rice Crunchins as the gluten free meal to the whole hospital!? This is not only an oversight on the part of the dieticians and the hospital staff, but it is EXTREMELY DANGEROUS to those who come to Alta Bates with Celiac's disease. We notified the nurses, who by this point were probably very used to us calling them, and they sent the message to the dieticians. After a few hours, the head dietician and a trainee came by to Romy's bed and were all crazy nervous and extremely apologetic. They seemed unaware that barley malt extract contained gluten. They told us that when they got our message, they had to go on the internet to check if it was true or not, and then realized that it DOES contain gluten. WTF!? Why didn't they do that before they decided on serving it? We then made a formal complaint, but who knows how far that will go. The dieticians said that they will initialize a large scale check on all the gluten free meals to check if they were indeed gluten free, and train all of their staff 'again.' Who knows if they are even competent enough to do that. Romy is clearly grossed out by the PICC line. This is a cartoon of how the PICC line goes in. After all of this food drama, the PICC team finally came by. They asked me if I wanted to watch or not. I did want to watch after all of the previous experiences we've had here. It seems like somebody always has to watch to make sure things go right. However, I quickly got the feeling that the PICC team was very competent and good at what they did. The team consisted of a guy and woman, and a cart full of supplies and an ultrasound machine. They informed me that they needed to make a sterile area around his arm, so I had to step back as far as I could and wear a face mask too. First they hooked him up with all the EKG probes, to measure his heart beat, and then they got the ultrasound ready and something to do with a magnetic pickup which would see where the tip of the catheter was going inside his veins. The team then put out a bunch of blue cloth blankets on top of Romy, which were the "sterile field." The blankets were sterile and then they rubbed the sterilizing stuff all over their arms and skin that was exposed beyond the blankets. The woman then monitored Romy's heart, and the guy began to inject the tip of the catheter into the side of Romy's bicep, and then into his vein. The team was so hysterical. The woman kept commenting about Romy's beautiful EKG, and if it was a fancy art piece in a museum. She was so serious when she said it. Then we watched the magnetic pick-up weave its way up Romy's arm as the guy was shoving the catheter into a tiny hole he punched through Romy's bicep. I was worried I would get a little sick, but it was like watching a funny movie. At one point Romy moved his hand onto the blue blankets so he could get a better look at the monitor, and the woman yelled out, "Don't touch the sterile field! The sterile field!!!!!" Romy was soooo confused and then she told him to put his hand back under the blanket. Without skipping a beat, she was back to complimenting and admiring Romy's beautiful and strong EKG signals. The guy got into it to, and then all of a sudden the catheter was in place, and it was all over. The guy counted 13 cm of line sticking out of Romy's arm, and then snipped it off, and attached an end to it that could be used to inject the antibiotics. He tested it out with saline fluid, which Romy said he could feel as a cold sensation. Then they removed the sterile field away, and gave him a few instructions, and left. The really nice Japanese man gave me the flowers his family sent to his room, because he said, "At least I can truly enjoy them." We are finally home! After the PICC line was in, Romy felt weirded out by it, but we were quickly distracted by the discharge operations. Once the hospital and insurance were notified that we were all set to go, it was amazing how quickly they rushed us out of there! Literally within a few hours, I was getting the car from where I parked it, and waiting for Romy who was wheel chaired out of the hell hole, and into the Subaru. But before we got out of there, the funny Japanese man next to Romy's bed insisted that we rob the room of hospital supplies. He told us to take it all, because the hospital has already charged us for everything we see in the room. Then he pressed the nurse call button and told her he needed a brand new package of latex gloves. The nurse looked confused but went to get them for him. When she came back with the gloves, the Japanese man handed them over to Romy, and said, "Here you go, you can use these." Hahahha! Then he told me to take the flowers that his family gave him the night before, because he thought I would enjoy them more outside of the hospital. He said it was too dark in the room for flowers anyways. What a nice man! We then drove the 15 minutes home, and that was it. For the next few weeks, I will need to give Romy an IV of antibiotics, and he will have to come in a few times to get checked out to see how his appendix is healing. At some point, the surgeon will remove his appendix. Tomorrow, a nurse will come by and teach me how to inject Romy with antibiotics.